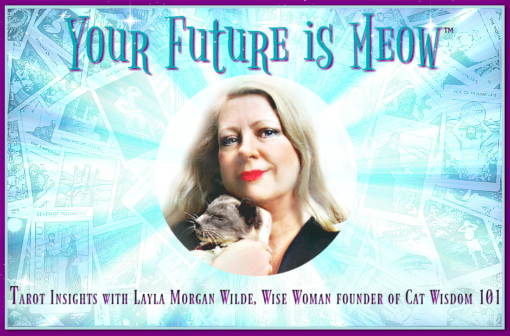 The Future Is Meow With Layla Morgan Wilde. We’re excited to announce the Future is Meow, a special event at Koneko, a cat cafe in NYC to benefit Angellicle Cats Rescue and promote our Black Cats Tell All project. 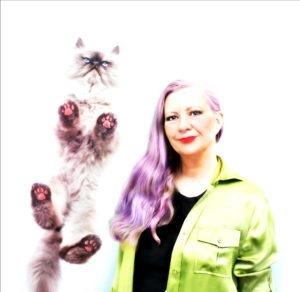 An insightful evening of numerology, tarot…and cats. Curious what the New Year has in store for you? 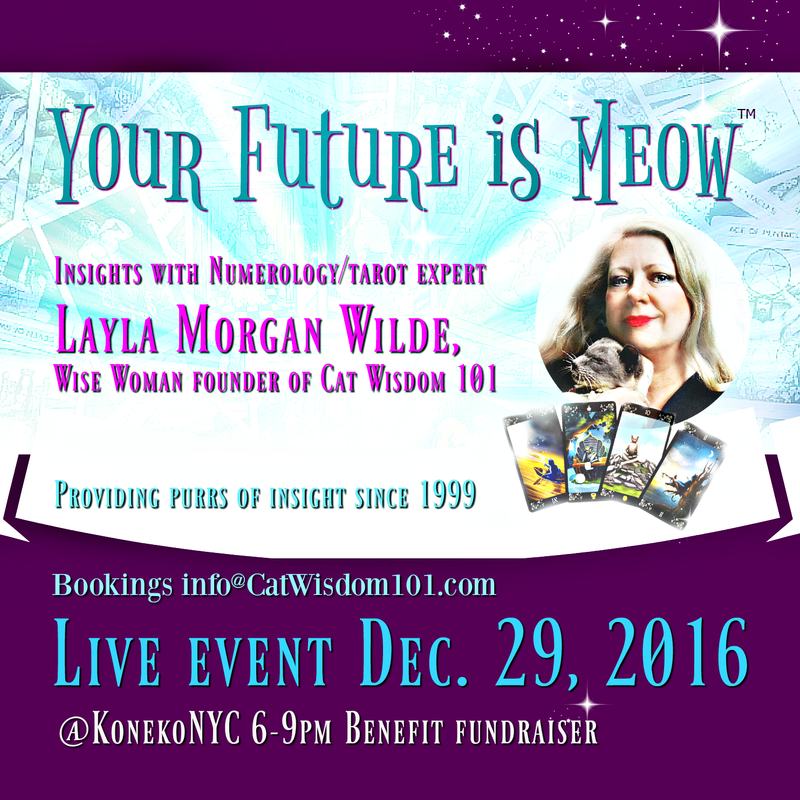 Come to Koneko on Thursday, Dec. 29 when our dear friend, celebrity cat expert and the wise woman founder of Cat Wisdom 101, Layla Morgan Wilde, will be our tarot expert-in-residence. Find out how you can best navigate love, life, and four years of the Commander in Tweet. Two ways to join the fun. 1) Group session: Layla will offer an interactive group Q & A session ($20/pp) plus cuddle time with the kitties, naturally. 2) VIP session: Layla will offer a private mini-readings, tarot/numerology ($40/pp), that includes a beverage of choice plus cuddle time with the kitties, naturally. This event will benefit Anjellicle Cats Rescue, Koneko’s rescue partner. VIP sessions will include a free copy of the Black Cats Tell All limited edition 2017 calendar valued at $20.00. Calendars will be available for purchase. If you’re not in the NYC area or can’t attend, please share this this post or graphic to help the kitties! Both Angellicle Cats Rescue and Black Cat Tell All project are a 501 (c) 3 nonprofits. Oh how I wish I could attend!! What FUN this will be! Caren, darn that you’re in Michigan. It would be so great to see you but Ill do your cards anyway. We hope the event is a huge success!!!!! This is a wonderful combu=ination of things all rolled into one. Purrs of luck to you. Shared on LI, G+, FB and Twitter. Sounds wonderful! We don’t have events like that here. Wish you well. Thanks, this is the first time that any cafe is doing something like this, so I’m excited. How very pawsome! I do wish I lived in the city at times like this. My area in South Florida is not very conducive to book type events. Good luck and I hope its a great success! How awesome! Good luck with this event – I’m sure it will be a great success! Thanks, we don’t have that many readers in NYC so paws crossed that everyone shares. The future is meow so it might be gloomy now but it can change in a moment. I’ll be doing more tarot online so if you have questions, let me now.